Those who do not learn history are doomed to repeat it, but those who do not see The First Purge are going to be fine. At the very least, the next Purge movie will likely offer up a similar mix of schlocky thrills, fake deep politics, and fleeting moments of genuine catharsis. This prequel to the popular horror series, which has already spawned three movies and a television series coming to cable this fall, is based on the premise that audiences want to know more about the backstory of the New Founding Fathers of America, a powerful group of elected officials who have instituted a national "purge" where all crime, including murder, is legal for 12 hours. As you'd imagine, these are not movies about credit card fraud. When the series kicked off with 2013's The Purge, an Ethan Hawke-starring home-invasion thriller with a touch of high-concept post-Hunger Games dystopian terror, there was a minimal amount of science-fiction world-building going on in the background. The movie was more concerned with the cat-and-mouse game going on in the house than the world outside. Each successive Purge movie has opened up the series both geographically and thematically, upping the contemporary allegorical details so much that 2016's The Purge: Election Year followed a blonde U.S. Senator played by Elizabeth Mitchell running for President. In The Purge's timeline, she won. Instead of following the fallout of the last movie, The First Purge goes back to where all this bloodshed began by zeroing in on the Staten Island community where the New Founding Fathers first staged their experiment. But director Gerard McMurray and writer James DeMonaco, who wrote and directed the previous films, still manage to evoke a wide range of ripped-from-the-headlines anxieties. 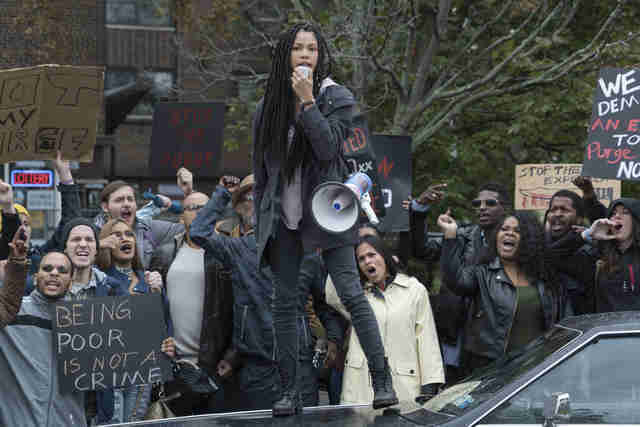 References to contemporary societal ills fly even faster than the bullets and the machetes: rampant unemployment, the subprime mortgage crisis, the opioid epidemic, and rising protests all get name-checked in the opening minutes. It's horror bathed in the glow of a cable news chyron. Depending on your tolerance for ham-fisted social commentary, The First Purge could feel as urgent -- or as tedious -- as a forcefully worded multi-tweet mega-thread. After an opening where we meet an unhinged drug addict named "Skeletor," the story shifts between scenes of the bureaucrats and academics tasked with carrying out the purge and the unlucky citizens who must survive the night. The latter group includes Nya, a weary activist (Lex Scott Davis), her impressionable younger brother Isaiah (Joivan Wade), and a local drug kingpin named Dmitri (Y’lan Noel of Insecure) who rules over the neighborhood with a combination of tough-guy swagger and love-interest sensitivity. At the start, Dmitri's main concern is keeping his stash safe and retaining his power in the neighborhood. But you can tell he has serious action hero potential. First, there's plenty of plot to set up, disposable side characters to introduce, and exposition to work through. Where previous Purges were nationwide affairs, the version we see in The First Purge only occurs in Staten Island and, at least in its early hours, it ends up being a bust. Given the opportunity to murder each other, most citizens use the time to throw elaborate block parties or hide out in their church waiting for the event to pass. If they stay on the island and get through the night, they'll each receive $5,000 -- and if they decide to enact some murderous fantasies (and wear some creepy blue contacts capturing video) they'll be rewarded with extra cash. Not many people take the bait. Faced with the prospect of a carnage-less purge, the New Founding Fathers decide to introduce their own roaming mercenary gangs of hood-wearing white supremacists and assault-rifle-packing commandos to the mix. These militia groups quickly take to the streets and enact a frightening genocide on behalf of the federal government. In a thankless role, Marisa Tomei plays the behaviorist behind the experiment who cringes at how her bizarre social engineering concept has been co-opted by politicians with a hateful and racist agenda. "What have I done?" she mutters at one point in a half-hearted manner that suggests she won't be coming back for any further sequels. Is there a larger point to all this cruelty? The Purge movies are often at their most ideologically potent when they assume a more militant (and pulpy) pose. There's a powerful charge to the final stretch of The First Purge, which finds Noel taking out KKK members and leather-wearing Nazis with the deadly precision of a man protecting his friends and neighbors from the coming apocalypse. 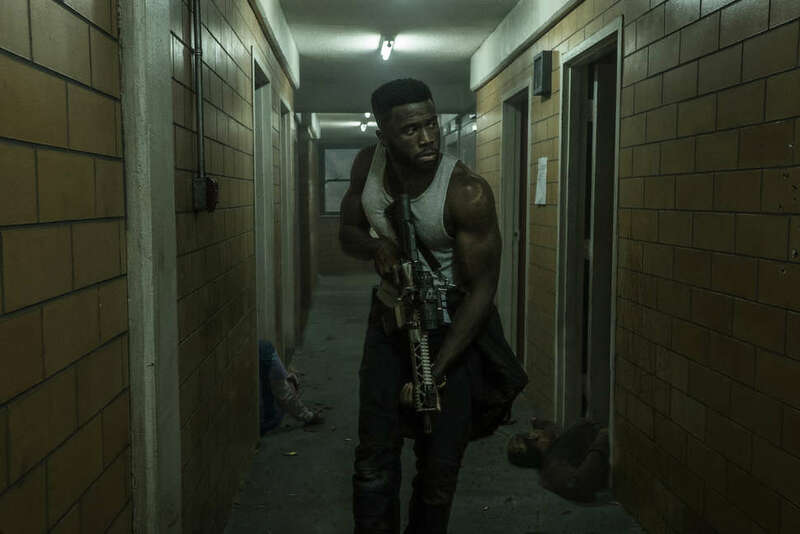 Despite being marketed as horror movies, the films in the Purge series are most effective when they shift into '80s action movie mode, and Noel is excellent at snapping necks and brawling in staircases. He's Rambo-like in his determination and purpose. The larger problem is that the film isn't really equipped to untangle the thorny implications of its complicated authoritarian set-up or its often tasteless imagery. McMurray wants to tell a small-scale, human story of perseverance against a backdrop of political chaos but his film rarely feels invested in the individuals it chooses to focus on. It's more excited by the bizarre costumes its villains wear, like a creepy Bane-mask with a doll's head for a mouthpiece, or the music supervision victory of scoring Kendrick Lamar's anthemic "Alright" for the closing credits. Sure, the song sounds cool, but it's doing almost all the heavy lifting. In a telling and incoherent moment midway through the film, the narrative briefly shifts to a minor league baseball field where we see a group of cops wearing what appear to be studded masks. They're stalking an unarmed black man who bleeds out on the dirt. It's a truly unsettling image. Who is he? How did he end up there? What's his story? Instead of trying to answer these questions, the plot leaves him behind. Onto the next provocation.